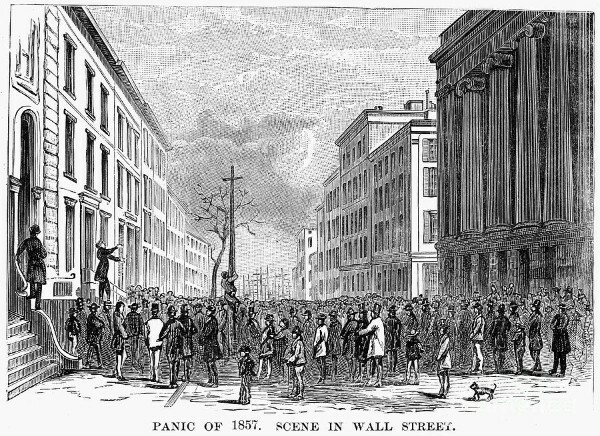 "Certainly the Panic of 1857 generated widespread anger over the unex­pected and sudden demise of national prosperity, which was quickly translated into political rhetoric. The financial debacle also left a social legacy that would haunt many individuals for several years. Although banks righted themselves quickly after the October suspension, com­merce and industry required more time to resume pre-Panic levels of activity. The consequence of slow recovery for industrial and commer­cial pursuits was unemployment. In the fall of 1857 poverty-stricken people remonstrated against their harsh fate by instigating strikes and conducting rallies for public relief. These activities became a center­piece for the next three years in sectional debates concerning the fate of the free laborers of the North. "New York City, with unemployment estimates ranging from 30,000 to 100,000, was the urban area with the greatest number of jobless and the most volatile social conditions. The mayor of New York in 1857, Fernando Wood, ... planned to aid the jobless by increasing employment on pub­lic works, which included the new Central Park, and to pay the men in cornmeal, potatoes, and flour. The mayor expected to finance this scheme by issuing bonds redeemable in fifty years and bearing 7 per­cent interest. Critics dubbed the proposal the 'bread and potatoes' message, but the attention of most journalists fastened onto one pas­sage in which Wood seemed to sanction the robbery of the rich by the poor. "To [New York Times co-founder and journalist] Henry J. Raymond, Wood's communication was an invitation to class warfare; the 'demagogue' Wood had raised 'the banner of the most fiery communism.' "